FIRST~ PLEASE CHECK THE CALENDAR to see if the time you want is available!!! That will save you time in your search for a vacation home. This extraordinary home features approximately 6000 square feet of luxury, and is located 20 feet from the lake. There are incredible views of the lake from the all the rooms and decks on each of the four levels. 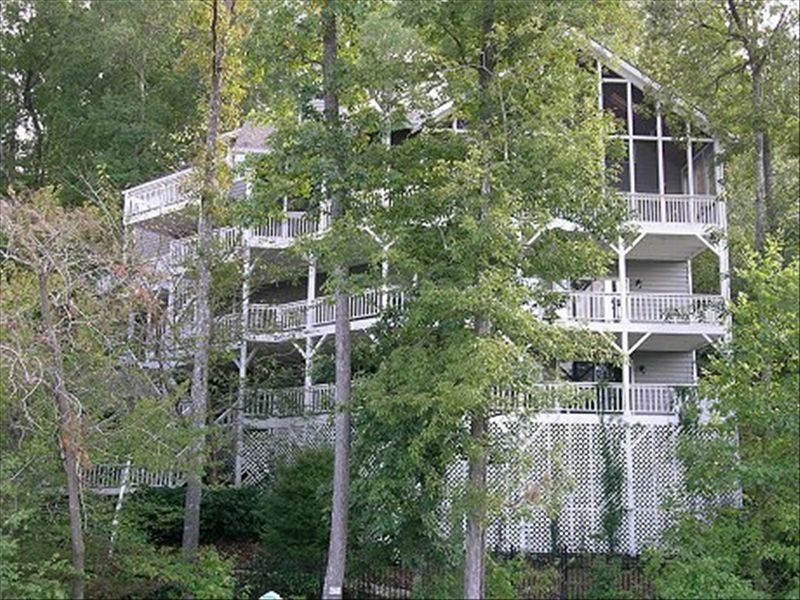 This home is located in Dawsonville, Georgia, in a beautiful setting and private cove. This home is close in proximity to 4 award winning wineries, the North Georgia Premium Outlet Mall, wonderful Golf Courses, the Appalachian Trail, Lake Lanier Water Park, and yes, even the largest kangaroo conservation outside of Australia that is great for a family visit. Ask me for the list of 'Fun things to Do' and make it a memorable vacation. Dahlonega is a wonderful quaint town that is 20 minutes away, full of shops and restaurants, so check out the Dahlonega Square. Take a trip to visit the amazing wineries for a tasting that are only 20 minutes away, or you can go hiking on one of the many trails on the close by Appalachian Trail. See the spectacular color's of Fall all around you. All this and more no more than 20 minutes away. The house sits in a hub of fun! The home has five spacious bedrooms, and can comfortably sleep 11, with a maximum number of 13 people. The home also features five and a half bathrooms, with everyone being able to enjoy their own private bath. The master bedroom, located on the fourth level, has a king bed and its own private deck, sitting area and bathroom with a stand up shower and a large jacuzzi-jetted tub. Also on the fourth level is a DSL station also wireless featuring a private desk. Located on the third level is the gourmet kitchen which is extremely spacious and features upgraded appliances. A washer and dryer are also available. The living room, dining room, and kitchen area with fireplace are wonderful for entertaining, and leads out to a large screened-in porch through 3 sets of french doors and grilling area overlooking the lake. Two more bedrooms, one with a queen and a twin bed and private bath and the other with a king bed a private bath are located on this level. The second level features a bedroom with a queen bed and full bath. Also on this level is a media room with a large screen television, DVD and VCR and a see-through fireplace, which is great for watching television or your favorite video. The first level of the home is a game room which has a pool table, foosball table, television, DVD player, fireplace and features a bedroom with a king bed and a queen sleeper sofa and full bath and steam shower, also with a large deck off with full lake view. The double slip dock with one oversized slip and party deck is right outside your back door. You can rent a boat nearby and take the scenic route over the lake to see the dramatic color's of Fall along the shoreline. PLEASE CHECK MY AVAILABILITY CALENDAR TO SEE IF THE HOME IS AVAILABLE FOR THE TIME THAT YOU DESIRE!!!! The home features 7 televisions, 3 DVD players, 1 VCR, 3 fireplaces, and a high-speed wireless DSL line for your convenience. I have been renting my home for several years and have provided wonderful memories for families from all over the United States. Evidenced by my repeat tenants, I can assure you that you too will come back with story after story of the wonderful time that was had. While the home always sells out during the summer, the folks who recognize the great time to be had during the Fall and Winter months also realize a huge savings on the rental. I enjoy sharing my home and hope that you too will come and stay and see what great time awaits you! I purchased this home because it is a beautiful home that sits on Lake Lanier, the largest lake in Georgia. I have been coming to Lake Lanier since I was a child and have great memories of time spent with family and friends and wanted to share this home with folks to make their own memories. So far, it has been a great success and I have enjoyed the spoils of having families make thier own Lake Lanier memories. It is rarely known that North Georgia has an array of great wineries that sit right on the mountains. The views are spectacular and the wineries themselves are gorgeous. Napa has nothing on the quality of these wines and spending a day touring these close in proximity wineries is a great time. I also enjoy Burts Pumpkin Farm. A HUGE pumpkin farm where family's can pick out their pumpkin and then picnic right there on the farm. In addition, I love going Christmas shopping at the North Georgia Premium Outlet Malls where I can get amazing deals on everything AND come back to enjoy a beautiful home with my family and friends. Hiking one of the many trails on the Appalachain Mountain to view the color's of fall is absolutely breathtaking. During the Summer, of course the scale of everything to do is enormous. Waterskiing, boating to where you can park the boat and have lunch or dinner, fishing right off the dock, or relaxing on top of the dock's party deck with a few friends. There is so much to do! This home sits approximately 20 feet from the back of the house to the waters edge. Private cove allows for safe swimming and calm water, its a no wake zone vs. out in the open water where the docks are constantly rocked. A view of the lake from every room. House is 20 feet from the waters edge. Extra towels, sheets and pillow cases provided too. Salt, pepper, several other spices. Everything you need in a kitchen. Balcony is off the Master bedroom. Great for star gazing! Foosball Tabble, Fireplaces (3), Phone/DSL Connection, Gas BBQ, Double slip dock, Most pets welcome! we enjoyed our stay at the home. 3 miles from North Georgia Premium Outlet Mall, wineries, Appalachian Trail, and SO much more.